From rugged coastlines to old-growth forests to orchid-carpeted swamplands, Ontario Nature’s reserves safeguard the province’s most imperilled habitats. It’s a few degrees below zero, but the March midday sun beats warmly with the promise of spring. The rays and a semi-hardened snowpack, broken only by tracks of otters and other small animals, makes walking through thickets of aspen, poplar, maple and ash relatively easy. We’re a party of five, working our way up the north side of the 39-hectare Altberg Wetland Nature Reserve, two kilometres southwest of Balsam Lake in the Kawarthas. The wetland, one of Ontario Nature’s 22 nature reserves around the province, was acquired in 1983, along with a second, bigger property about 30 kilometres north. The portion that we are trekking across is a modest chunk of a much larger, provincially significant marsh and forest swamp complex extending all the way to the lake, which had remained largely unstudied until 2007. That’s when the Kawartha Field Naturalists signed on with Ontario Nature as local stewards and began the first inventories of plants, animals and other features of the property. 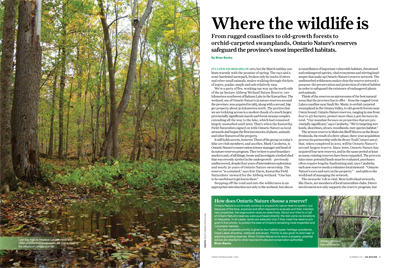 Stepping off the road and into the wilderness is an appropriate introduction not only to the wetland, but also to a constellation of important vulnerable habitats, threatened and endangered species, vital ecosystems and stirring landscapes that make up Ontario Nature’s reserve network. The undisturbed wilderness makes clear the reserve network’s purpose: the preservation and protection of critical habitat in order to safeguard the existence of endangered plants and animals. The newest reserve is Malcolm Bluff Shores on the Bruce Peninsula, the result of a three-phase, three-year acquisition process (in partnership with the Bruce Trail Conservancy) that, when completed in 2012, will be Ontario Nature’s second-largest reserve. Since 2000, Ontario Nature has acquired four new reserves, and in the same period at least as many existing reserves have been expanded. The process takes time: potential lands must be evaluated, purchases often require lengthy fundraising and, says Carabetta, each new reserve needs a volunteer local steward– “Ontario Nature’s eyes and ears on the property” – and adds to the workload of managing the network. How does Ontario Nature choose a reserve? 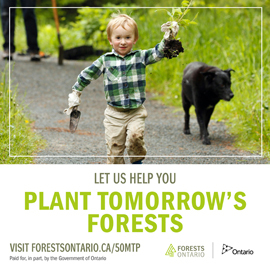 Ontario Nature is continually working to expand its nature reserve system, but because of the time, expense and effort required to evaluate and then maintain new properties, the organization does so selectively. About one-third to a half of Ontario Nature’s reserves were purchased directly; the rest came via donations or bequests. 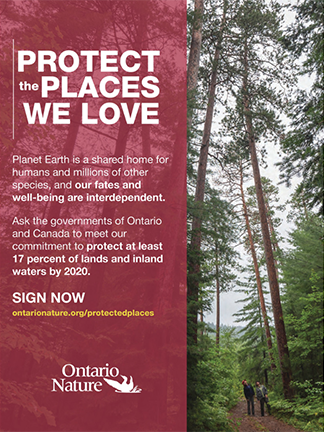 In all cases, lands are selected only if they meet the reserve program’s first priority: to protect the best of Ontario’s remaining most imperilled and vulnerable habitats. For new properties priority is given to four habitat types: heritage woodlands, Great Lakes shoreline, wetlands and alvars. Priority is also given to land near or adjoining existing reserves. When Ontario Nature turns down a property, potential donors are directed to other local land trusts and conservation authorities. Ontario Nature (then Federation of Ontario Naturalists) bought its first reserve in 1962, at Dorcas Bay on the Bruce Peninsula. That property is now part of Bruce Peninsula National Park, and the title of oldest existing Ontario Nature reserve has passed to Petrel Point, farther south on Lake Huron. The organization acquired that reserve in 1967 and has since expanded it four times. The network’s fastest growth occurred during the 1980s and 1990s, when 13 new reserves were created. Their creation exemplifies wider interest in the land trust movement in the province, which Ontario Nature has helped foster. Changes in tax policy in the late 1980s, which encouraged landowners to preserve private land, were partly responsible for the growth of nature reserves, followed by, in the 1990s, tax credits for a donation of ecologically sensitive lands. Carabetta says that half to two-thirds of the reserve properties came through donations and bequests.